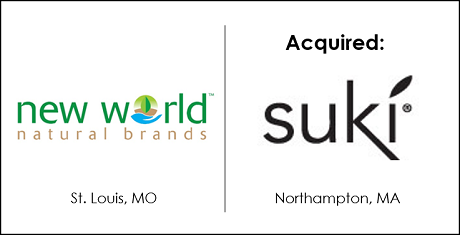 New World Natural Brands Acquisition of Suki, Inc.
New World Natural Brands is a rapidly growing holding company dedicated to growing brands in the natural beauty and personal care space. This is their second acquisition this year in the industry. problems and no real, long-term or honest solutions available. Kramer noticed a void in the market for 100% synthetic-free skincare that outperforms the standard treatments, synthetics and pseudo-naturals. Her products focus on visible results for healthy aging, cystic acne, rosacea, eczema and psoriasis. Kramer will continue to formulate new products as well as promote the Suki “Know Your Beauty” philosophy as a Brand Ambassador after the acquisition as part of New World Natural Brands’ family of companies. “I am excited to continue doing what I love most – formulation strategy – and of course helping consumers get the most thorough and honest information possible with my blog SukiScoop. Through my deep industry knowledge, Suki Skincare will continue to form meaningful connections with our consumers. It is a win-win for all of us,” Kramer said. The transaction closed on July 27, 2018. Terms of the transaction were not disclosed. The DVS Group and New World Natural Brands will continue to work together to grow New World Natural Brands with additional acquisitions this year.